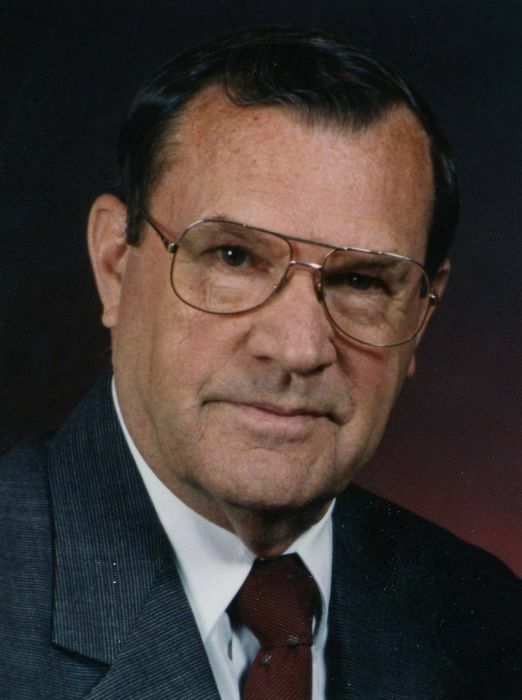 James E. “Ed” McAlpin, 91, of Fort Wayne, died Monday, April 8, 2019, at Apple Ridge Assisted Living in Fort Wayne. He was born May 19, 1927, in Bedford to the late Wilford and Cora (Boone) McAlpin. Ed was a World War II veteran of the U.S. Air Force serving from 1946 to 1947. He was a sales representative for Nicholas Food Brokerage for 30 years, worked as a service technician for Bowman & Albright in Waterloo, and then worked for the Lincoln Company in Fort Wayne for five years, retiring in 1992. He was a wedding photographer for many years. During the 1970s, he served as justice of the peace for Grant Township in DeKalb County. He was a member of Trinity United Methodist Church in Fort Wayne. He also was a member of the Ashley Masonic Lodge, 50-year member of the Fort Wayne Scottish Rite and a former member of the Waterloo Lions club. Ed married Joan Marvel on Nov. 25, 1989. in the Good Shepherd United Methodist Church in Fort Wayne. Surviving are his wife of 29 years, Joan McAlpin of Fort Wayne; three children, William “Bill” McAlpin and his wife, Michelle, of Peru, David McAlpin and his wife, Mary, of Auburn, and Dianne Walker and her husband, Rev. Ken, of Auburn; stepdaughter, Vicki Morgan and her husband, Walt, of Reading, Pennsylvania; eight grandchildren; and six great-grandchildren. He was preceded in death by his parents; son, Marion McAlpin; two brothers, Wayne McAlpin and Paul McAlpin; and a sister, Gerry Vanliew. Services will be 2 p.m. Friday, April 12, 2019, at Trinity United Methodist Church, 609 Putnam St., Fort Wayne, with Pastor Debbie Smith officiating. Burial will follow in Lindenwood Cemetery in Fort Wayne. Visitation will be from noon-2 p.m. Friday prior to the service at the church. Memorials may be directed to Heart to Heart Hospice, 7221 Engle Road, Suite 100, Fort Wayne, IN 46804 or Trinity United Methodist Church, 609 Putnam St., Fort Wayne, IN 46808.